Subscribe on iTunes or follow the Make/Time Podcast on Facebook and on Instagram for regular updates and new episodes. Cynthia Schira is a weaver and designer living in Westport, New York. In the course of her career, Cynthia has given special attention to working with computers and the Jacquard loom—an early precursor to the modern computer—to explore the digital qualities and possibilities of the art form. 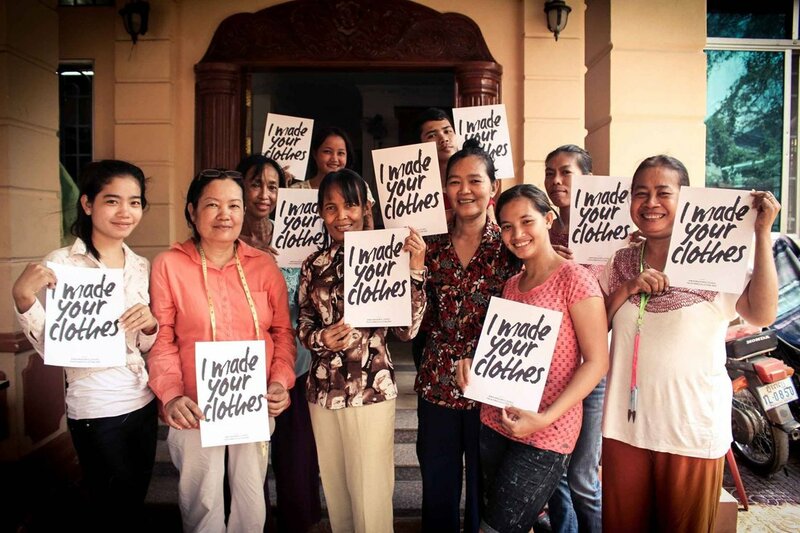 In 2008 Rachel Faller traveled to Cambodia on a Fulbright Fellowship to research artisans and fair trade organizations and wound up founding Tonlé, an ethical, zero-waste fashion business in Cambodia making contemporary women's apparel out of garment factory remnants. ​A weaver and designer, she combines her knowledge of making and materials with an entrepreneurial vision for building an ethical business. Cristina Còrdova is a sculptor and ceramicist living and working in Penland, North Carolina. A trained dancer, she brings a sense of movement and musicality into her figurative sculptures. Susie Ganch is a jeweler, sculptor, and environmentalist who lives in Richmond, Virginia. She teaches in the Craft and Material Studies program at Virginia Commonwealth University, and she works frequently with Radical Jewelry Makoever and Ethical Metalsmith. 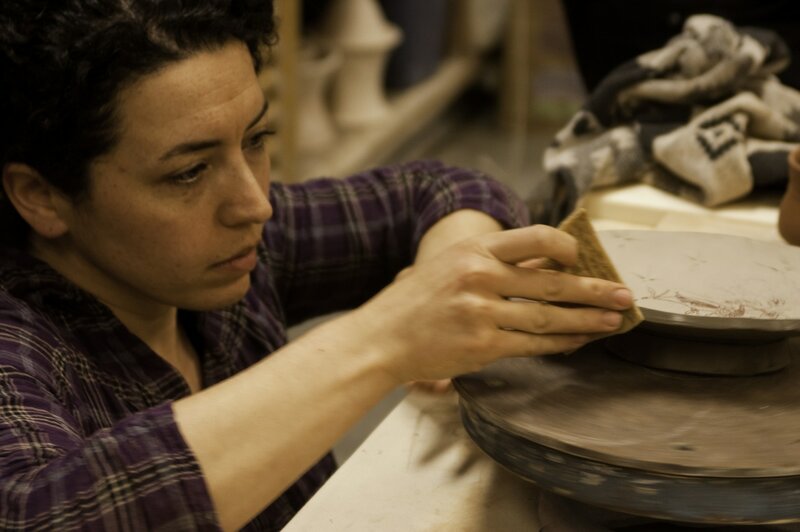 Potter Sanam Emami was born in Iran and grew up in England and the US. She lives in Colorado and is an associate professor of art at Colorado State University. 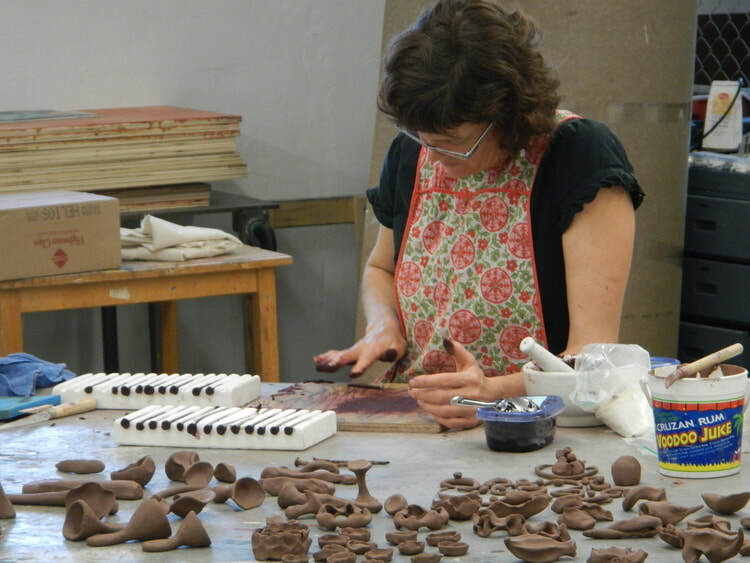 For her, making pots, and understanding her voice within that work, is a continuing journey. Michael Strand is a potter, an activist, and an optimist. He crafts innovative projects that connect the handmade to the community, and that lead participants and the artist to new understandings of themselves and of the world. 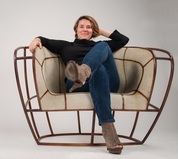 Rosanne Somerson is a renowned furniture maker and artist. She talks about being a woman in what was at the time she started a male-dominated field. 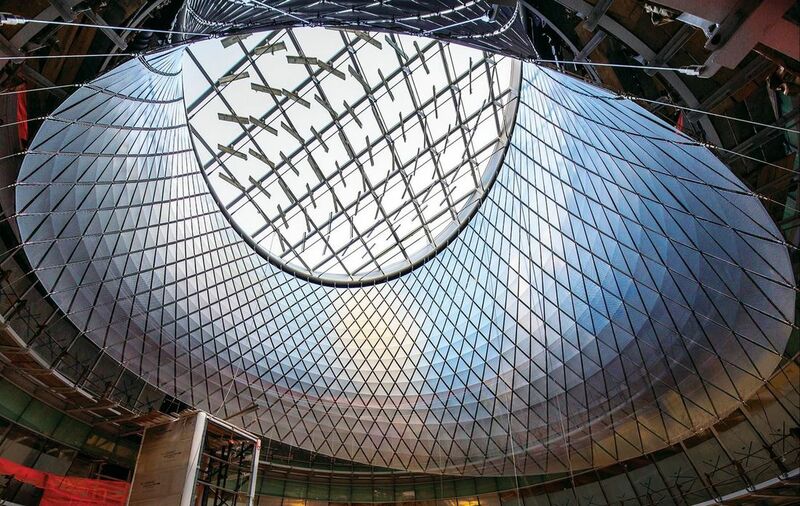 For over 50 years, James Carpenter has combined art, engineering, and design, using natural light and glass as key elements of his work, which includes major projects at the Fulton Transportation Center in New York City and the Israel Museum in Jerusalem. Jamie earned a degree from RISD, where he studied architecture while also working on projects in glass with Dale Chihuly. He is a MacArthur Foundation fellow and the recipient of an Academy Award in Architecture from the American Academy of Arts and Letters. Host Stuart Kestenbaum talks with furniture designer Vivian Beer, winner of HGTV's Ellen's Design Challenge, about learning how to blend traditional making with new technology, and how her time on the tv design contest showed her that not only can great design be made more cheaply, but it should be. Vivian Beer from Social Impact Studios on Vimeo. 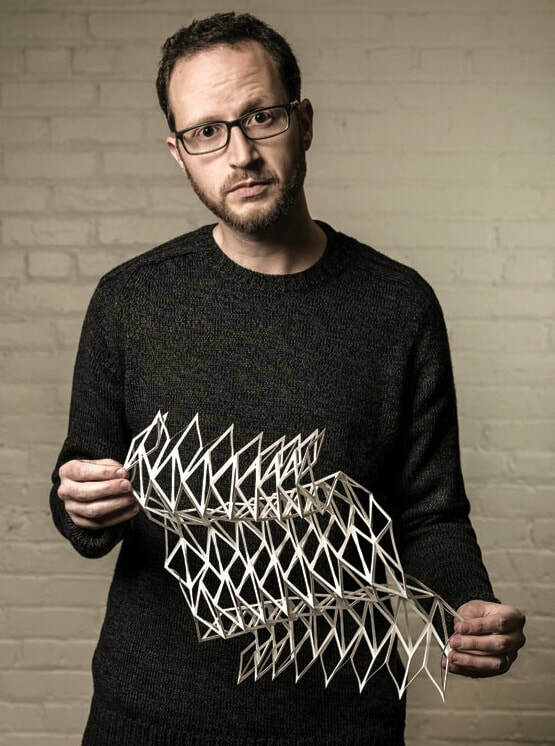 ​Matthew Shlian is an artist/designer and founder of the Initiative Artist Studio in Ann Arbor, Michigan. His work ranges from drawings to large-scale installations to collaborations with scientists at the University of Michigan. He's widely known for his work with folded paper, but as a maker he doesn’t see himself fitting into a particular category—he likes to work with what he has at hand—without being able to predict the results. He makes his work from what he calls ‘a place of not knowing’. Alleghany Meadows is a potter who lives in Carbondale, Colorado. He received his BA from Pitzer College, Claremont, CA, and his MFA from Alfred University. His ceramics are in many private and public collections including of the Museum of Fine Arts Houston and the Long Beach Museum of Art. Alleghany’s work extends beyond ceramics to projects that engage communities—both local and national. 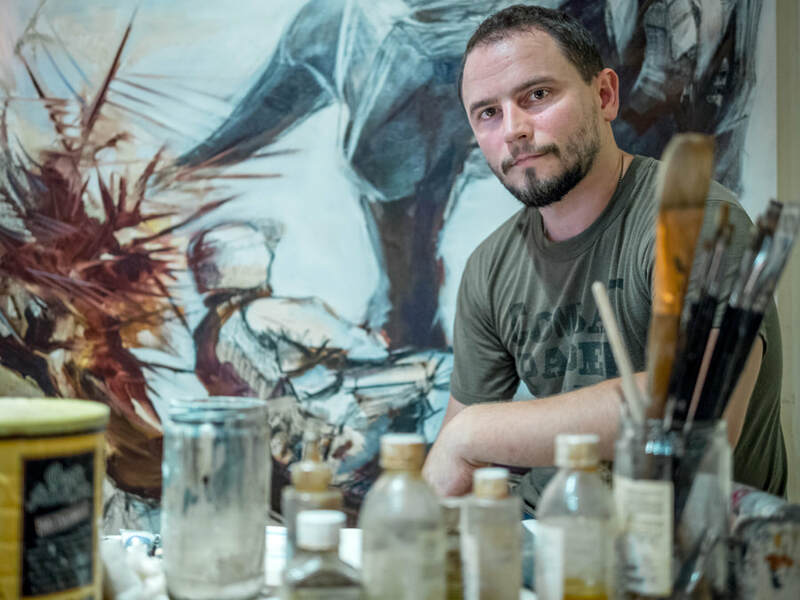 He’s the co-founder of the Artstream Nomadic Gallery—a mobile gallery in a renovated Airstream trailer that travels around the country exhibiting work of contemporary potters. Joyce Scott is a sculptor, quilter, and performance artist. Her most recent exhibit Joyce J. Scott: Harriet Tubman and Other Truths at Grounds for Sculpture in Hamilton Township, NJ combines beadwork, glass made in Murano, Italy, found objects and other materials. Theresa Secord is a Penobscot basket weaver and founder of the Maine Indian Basketmakers Alliance. 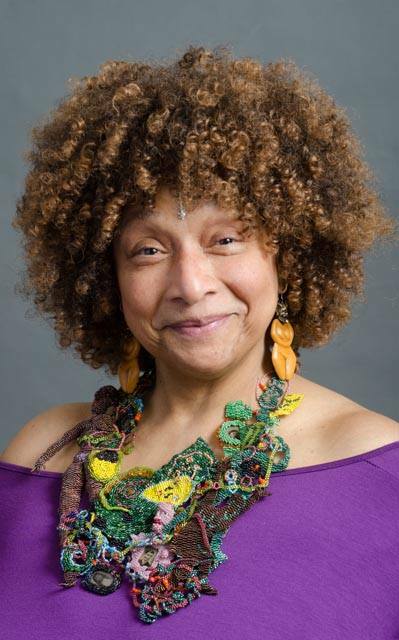 She was recently named a National Heritage Fellow by the National Endowment for the Arts. In this episode, Tim McCreight talks to Stuart Kestenbaum about his path to becoming a jeweler, teacher, publisher, writer, and activist. Namita Gupta Wiggers is a curator, writer, educator, and artist living in Portland, Oregon. She began her career in museums, eventually serving as curator and then director of the Museum of Contemporary Craft in Portland. 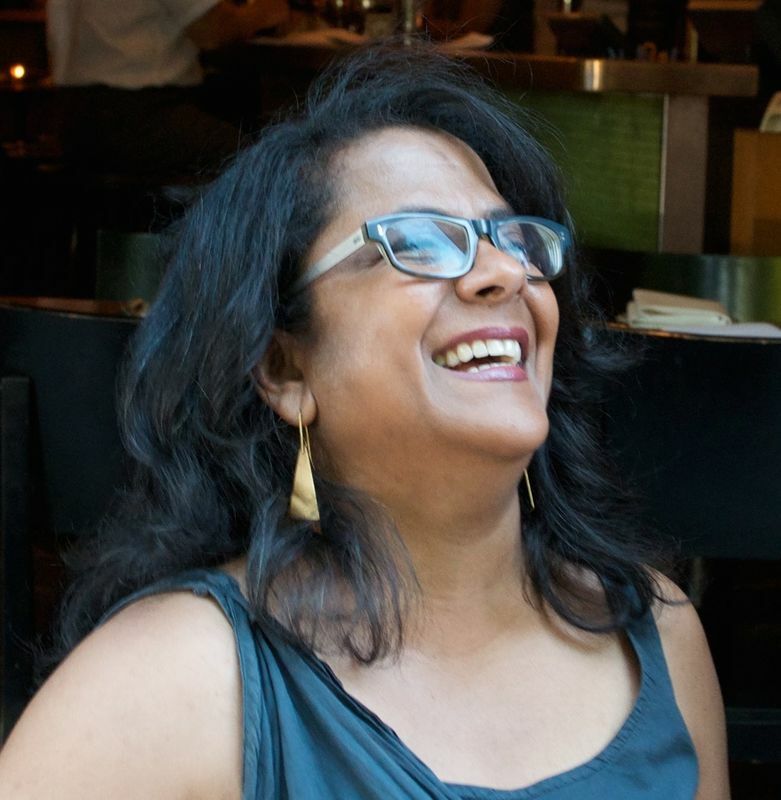 Namita is a co-founder of Critical Craft Forum, which provides spaces for makers to discuss critical issues to the field of craft, including a recent symposium on Gender and Jewelry in New York City. In this episode, host Stuart Kestenbaum talks with sculptor Tom Joyce. 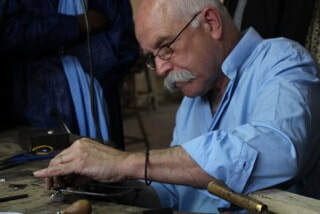 Trained as a blacksmith when he was a teenager, Tom Joyce's art work can be found in museums across the country, including the National September 11th Memorial and Museum in New York City. Roberto Lugo is a potter living and working in Vermont. 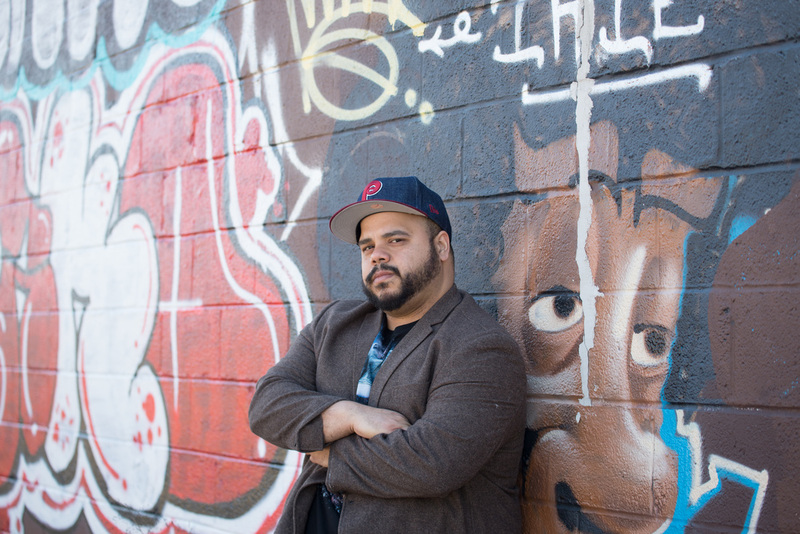 He grew up in the Kensington neighborhood of Philadelphia and began his creative life writing graffiti. Roberto is a professor at Marlboro College, and he talks about the different languages of academia, the pottery room, and the community where he was raised and the challenges and joys of truly communicating across cultures. 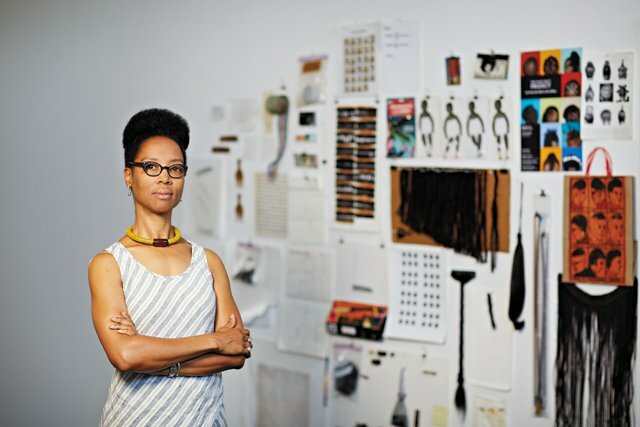 Stuart Kestenbaum talks with artist Sonya Clark about family, roots, textiles, and the joys of making art in a community. Lily Yeh is a co-founder of The Village of Arts and Humanities, for which she also has served as executive director and lead artist. economic development. In 2002, Lily began Barefoot Artists, which continues her style of community building through art on an international level, in places such as Rwanda, Kenya, Ghana, Ecuador, and China. 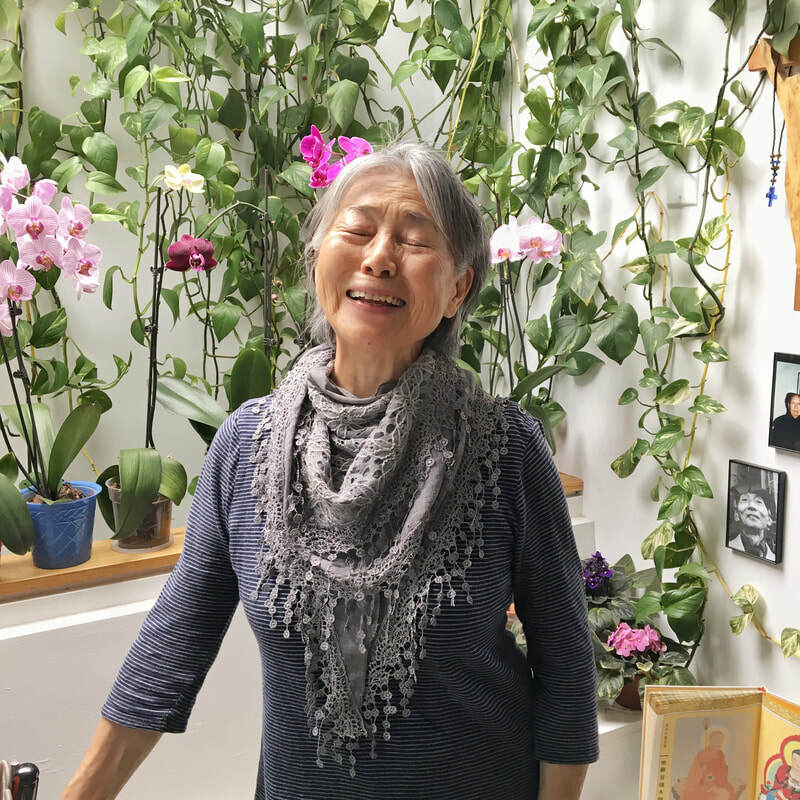 Lily Yeh seeks to build a more compassionate future through her collaborative work. David Chatt grew up in the Pacific Northwest, mostly in Washington State. Recently he has been an artist-in-residence at the Penland School of Crafts in North Carolina. Whatever the medium or the finished work, at heart he’s a storyteller. 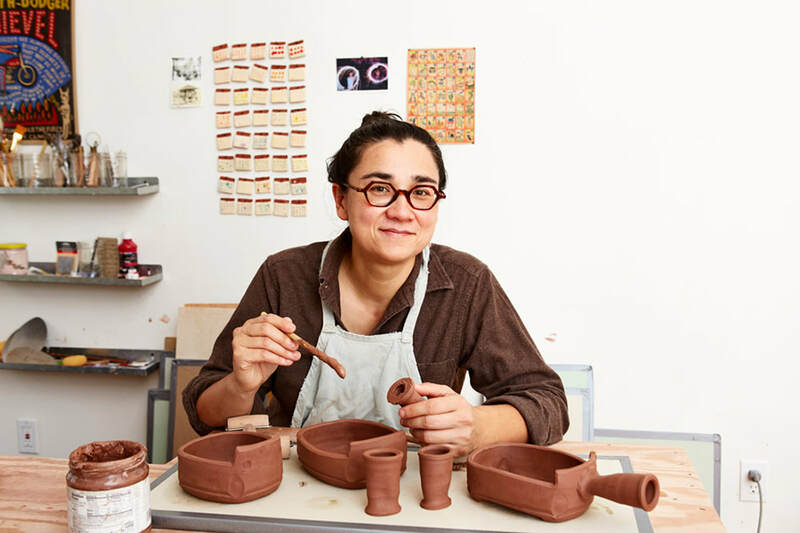 Ayumi Horie is a potter, maker, and activist living and working in Portland, Maine. She is also a social media innovator in the craft world and the curator of the popular Instagram feed Pots In Action (@potsinaction).Recently, as a recipient of the United States Artist Fellowship, she has turned her attention to learning and including digital and industrial processes in her work. 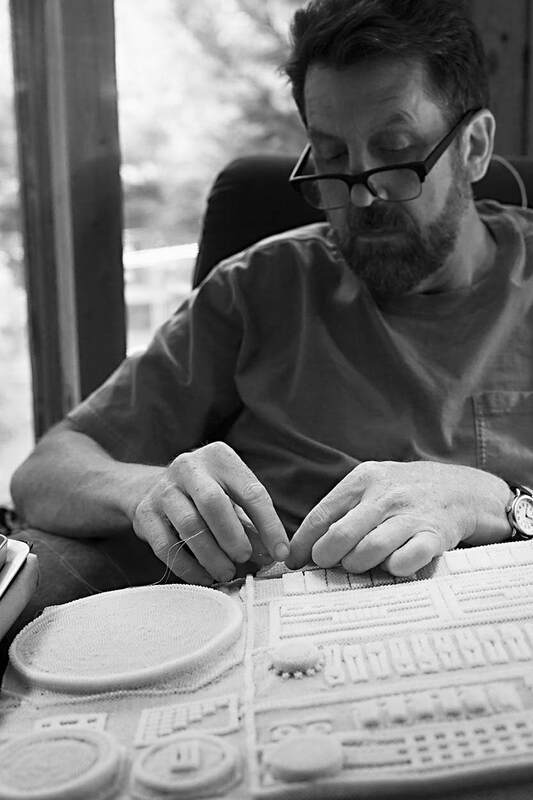 David Keefe is a printmaker, visual artist, and executive director of Combat Paper NJ. David is a former United States Marine who served in Iraq and is Senior Assistant Dean of Student Veterans’ Initiatives in the General Studies Program at Columbia University. Rowland Ricketts is an indigo grower and artist based in Bloomington, Indiana. He studied traditional indigo making and dyeing techniques in Japan, where he was living after college and where he met his wife, Chinami, who is a weaver. Sculptor Nancy Callan graduated from the Massachusetts College of Art in 1996 and now lives in Seattle. In addition to making her own work in blown glass, she was for many years a key member of Italian maestro Lino Tagliapietra’s glassblowing team. She also collaborates with New York City lighting designer Lindsey Adelman. Nancy’s own work is in the permanent collections of the Corning Museum of Glass, the Shanghai Museum of Art, and the Museum of Glass in Tacoma, WA. As a woman working in the traditionally male-dominated field of glassblowing she says, "I had to work twice as hard as the boys did." 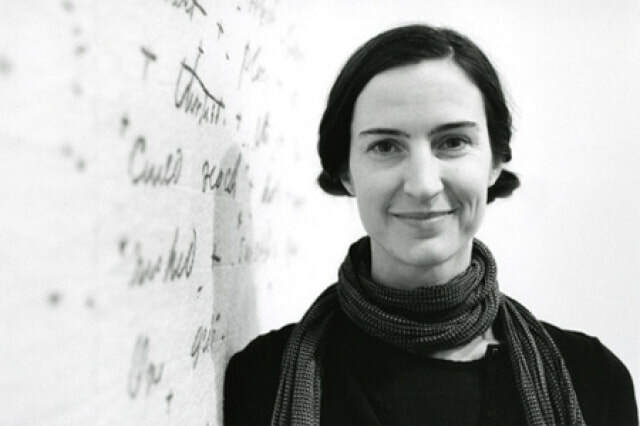 ​Jen Bervin’s interdisciplinary work often combines art, science and writing. One recent project is Silk Poems, a poem written nanoscale in the form of a silk biosensor in collaboration with Tufts University’s Silk Lab, and also published as a book. 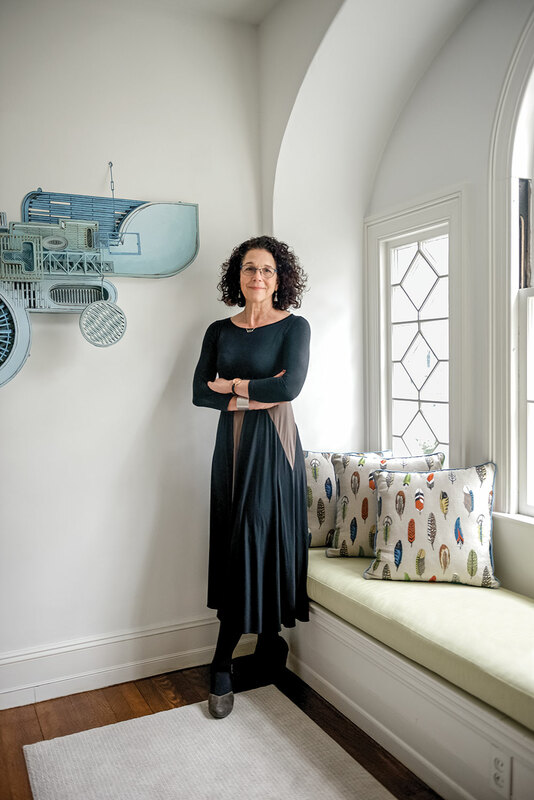 Cynthia Schira is a weaver and designer living in Westport, New York. ​ In the course of her career, Cynthia has given special attention to working with computers and the Jacquard loom—an early precursor to the modern computer—to explore the digital qualities and possibilities of the art form.